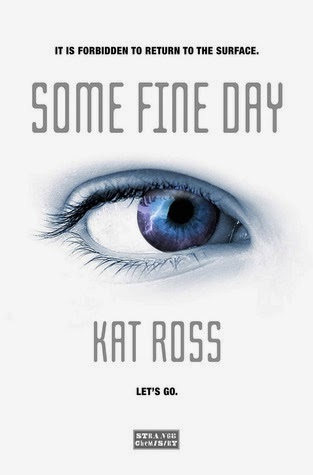 Set in a world where super-powered hurricanes devastated the planet, a highly trained soldier who never saw the sun before gets an unwanted extended excursion on the surface and learns that her life has been a lie in SOME FINE DAY by Kat Ross. Jansin has been lied to. On all counts. " This was a fast-paced, Young Adult read. I got Jansin. For so long she's been going along with the program, enjoying the life as one of the near-elite, but she feels disconnected. She left her family at a young age to go to the Academy, she isn't sure that her boyfriend really likes her or just wants a well-placed connection with her father, the general, and she isn't a diehard believer in the goals of her government. Yes, she is well-trained, but that doesn't mean she wants to go to war. She's at a crossroads, like most of us at graduation, and that is when her father gifts her with a vacation to the surface. Seeing the sun, feeling the air and the ocean, it makes it hard to go back underground. Of course, then she ends up captured by hypercane survivors and staying alive becomes her goal. Then, as she comes to find her place on the surface world, she has to question where she wants to belong. I liked that, although as I said this is a fast-paced book, the action unfolds over almost a year, so when Jansin makes friends, she didn't just meet them a day ago and now they are a cohesive team. Jansin is not someone who trusts easily and the story reflected that. The ragtag bunch of survivors was endearing and I wish we got to spend more time with them. On the romance front, there is a love interest but no triangle. Also refreshing, said love interest is not a bad boy, nor does he continually push her away because reasons. He's smart and fairly level-headed. Jansin's home of Raven Rock is a fascist regime and it's easy to on the surface paint the underground societies as evil, that left the rest of humanity to die above. However, we do get at least some hope that not all of the governments are as harsh as Raven Rock. Also, it can't be denied that while life is absolutely not perfect below ground, that living there did save lives. The end goes quickly and there are some loose ends, a few that I really wish has been solved before the finish, but overall I liked where it went. I'll be looking for more from Ross. Note: Unfortunately, this morning I heard that Strange Chemistry is shutting down and it's catalog has been cancelled. Some Fine Day was a fine read, and I hope that Ross is able to find a new home for it.